As the all-new 2016 Chevrolet Camaro rolls off the assembly line and into dealerships, Camaro enthusiasts will discover surprisingly good driving dynamics, a powerful set of engines, and less bulk and weight. The surprising sophistication stems from the shared underpinnings with another favorite of ours: the Cadillac ATS. No wonder this pony car feels like a high-end sports coupe. Enjoy the ride! Chevy Camaro is it! Fun, beautiful, fast and safe. Firstly I absolutely love my 2016 Chevrolet Camaro, it is a beautiful nightfall metallic gray, with black 20� wheels is a sweet ride and it is performance is awesome! It is comfortable to drive with it is heated steering wheel & heated plus cooling seats, and it is v6 engine is quite the go getter, let's just say if I need pass, it is not a problem. Extremely fun to drive. I bought it brand new off the lot a little more than 2 years ago & honestly can say I have not had any issues with it. The only thing that is a little bothersome is the tires are filled with nitrogen & it is not always easy to find places that fill with that near me, I used to make a special trip to the dealer to get them filled if needed, but was told adding regular air you can get for free at some gas stations is perfectly fine, so now that is what I do. So, if your in the market for a new or used car the Chevrolet Camaro is worth a test drive. Enjoy the ride! 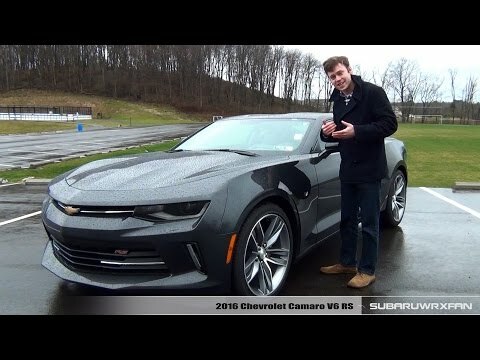 2016 Chevrolet Camaro so is the best! I love this car. Its stylish, fast and a real head turner. Interior is the most comfortable of any sports car I have ever owner. Great on fuel. Its may be a v8 but I get mileage like a 4 or 6 cylinder! I have owner it for over 2 years now and have had only a minor issue. Oil changes and tires and a weekly washing. I own the so model. Middle road performance.. But it comes with a 4 cylinder option and a 6 cylinder option too. But if you want the big dog daddy.. The zl1. Beautiful contour of the body to match a beautiful 6. 2l engine. The Camaro ss has a fierce look about it and performance to match. They made the 2016 Camaro ss with a all new 8 speed transmission that the technicians do not know too much about so fixing my transmission has been trial and error. The torque converts have defects that warranty covers. The Camaro as gets great gas mileage for a v8 6. 2l engine. The dual exhaust really gives it the sound effects to boost its fierceness!